Botanical Garden Nashik is also known as Pandit Jawaharlal Nehru Van Udyan. It is the new attraction for tourist and locals. This beautiful botanical garden was developed in the year 2016. 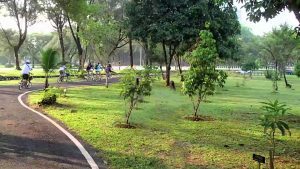 MNS president Raj Thackeray had proposed the concept of this park, created in collaboration with Forest Development Corporation, Nashik Municipal Corporation, and Tata Trust. The botanical garden was renewed from an old herb garden. Fantastic ‘Laser Show’ in the open field is attracting visitors towards this Botanical Garden. Seat arrangement is made in a Colorful butterfly shape. The massive replica of the elephants is a huge attraction for children. A special arrangement of a bicycle is available to wander around the area. These are some features of Jawaharlal Nehru Van Udyan set up at the foothills of Pandavani Caves.The entrance door is 40 feet huge. 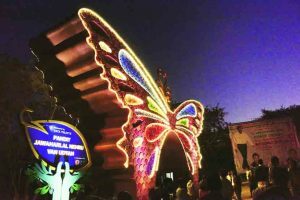 The unique entrance to the beautiful butterfly-shaped fascinating electric lighting system has been created to realize the uniqueness of this park. This garden remains closed on Wednesday. The visitors can visit this place from Thursday to Tuesday between 10 am to 7 pm. If you are going there to experience that electrifying laser show then you need to reach there by 7 pm. Laser show timing is 7 pm and 7:45 pm. How To Reach Botanical Garden Nashik? Botanical Garden is located at the distance of 7 km’s from Nashik City. City bus transportation is available to reach there. The city bus is the easiest and cheapest way to reach. You can also hire an auto from Dwarka or Mumbai Naka. If you have your own vehicle then you just need to travel towards Mumbai using Nashik-Mumbai express highway. After historical Pandavalena Caves, you will get the Botanical Garden. Thank You for reading this article. Kindly submit your valuable feedback.